Every year, ClearIAS used to publish a short analysis of Indian Budget and Economic Survey. Our post, covering the highlights of Indian Budget 2016-17, is ready. We plan to release the highlights of Central Plan 2016, Central Assistance 2016, Economic survey 2015 etc in coming posts. It has to be specially noted that Union Budget 2016 comes at a time when there is an additional financial burden to due the implementation of 7th Pay Commission Report and OROP (One Rank One Pension). But Finance minister, Arun Jaitley has managed to continue the good track record by adhering to FRBM (Financial Responsibility and Budget Management) policies. What makes a good budget? As we noted in our analysis of Indian Budget 2015, a budget with zero fiscal deficit may not be always a good budget. A budget can be considered good if it focuses on the right areas, if it sets the priorities right and if it shows the vision of the government. Every budget has two sides – receipts and expenditure. 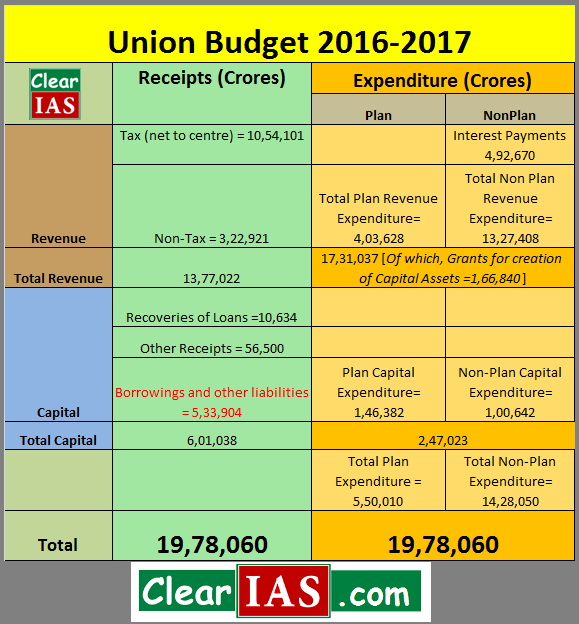 The below given figure (table) shows clearly shows the receipt and expenditure components of Union Budget 2016-17. You may compare Indian Budget 2016 with Indian Budget 2015 to understand the change in the values of crucial parameters. do we need to memorize these figures or just understanding the concept is enough?